Are you fascinated in exploring the past? Do you find interest in the history of our nation, a specific time period or another country? The study of history requires a student to delve into the past and ask the question: How did that impact where we are today? Students analyze the complexity of history ranging from documented events to understanding how those events were influenced by mindset, the cultural norm as well as economic, political and religious factors. A variety of classes will have students exploring history from a local to a worldwide perspective, inviting students to walk in the footsteps of their ancestors and compare it to their modern day. Barton Community College's history curriculum is designed to provide the general education requirement and core history courses for students who plan to transfer to a four year college or university to complete a bachelor's degree in history. In addition to general education courses in American History, we offer a variety of electives including Western Civilizations, Kansas History and Military histories. Electives must meet the requirements of your transferring institution. Students should coordinate with their advisor for transfer requirements. Opportunities for involvement are available in professional organizations like Kansas Historical Society and American Historical Association. There are additional options in public history that prepares students for work in a museum or archive. The Cohen Center for Kansas History is dedicated to preserving resources in Kansas and inspiring research in Kansas History. 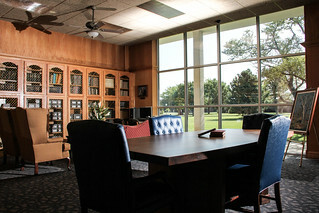 The Center is in the southeast alcove of Learning Resource Center on the main campus and is the result of the generosity of Barton P. and Dr. Mary Davidson Cohen of Leawood, Kansas.